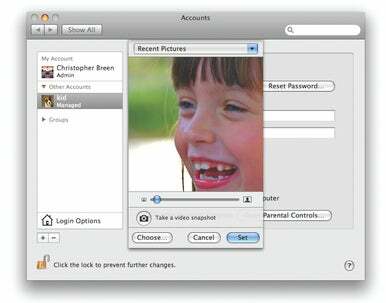 Parental Controls enable you to constrain what kids can do on the Mac. How severely you limit access depends on what you believe they can handle, in terms of both complexity and content. Log in as an administrator, launch System Preferences, and go to the Accounts preference pane. Click on the lock icon and enter your administrator password. Choose Login Options and turn on the Enable Fast User Switching option. Now add another user by clicking on the plus-sign (+) button below the list of accounts. Choose Managed With Parental Controls from the New Account pop-up menu, select a user name (and a short name if you like), and enter a password that your kid will be able to remember. Click on Create Account. Select the new account from the list on the left, then call your kid over to pick an icon. Got an iSight? Put your child in front of the camera, click on the current icon, select Edit Picture, and click on the Take A Video Snapshot button (funny faces encouraged). You can tweak the resulting picture by moving the size slider or by clicking on the image and dragging to reposition it. Select Set when you’re done. To do this, turn on the feature, then launch the Parental Controls preference pane from another computer on the network—you’ll see the name of your child’s Mac under Other Computers. Click on the lock icon at the bottom of the screen and enter your administrator’s password. Select the name of the Mac you’re managing and enter the administrator name and password for that machine. Your kid’s account should now appear below the name of her computer. Click on that account to access all of the Parental Controls settings as if you were on the actual machine. Regardless of whether you’re managing an account remotely or from the computer you’re sitting in front of, when you select your child’s account you’ll see five tabs—System, Content, Mail & iChat, Time Limits, and Logs. The settings you choose in each will vary depending on the child’s age. With young children (eight and under), you have two goals: to simplify the interface (while protecting your data) and keep them away from inappropriate content. With Leopard’s Parental Controls settings, you can go a long way toward accomplishing both objectives. Some of these controls may also come in handy if you have older kids. Simplify the System If you’re worried about overwhelming your tot with icons, menus, and other doodads, you can declutter the interface by selecting Use Simple Finder (under the System tab). Once this is enabled, your kid sees just four Finder menus: Apple, Finder, File, and Help. The Dock contains icons of active programs; the My Applications, Documents, and Shared folders; and the Trash. That’s it. Gone are the desktop hard-drive icon, Finder-window sidebars, and contextual menus on the desktop. Items inside the My Applications, Documents, and Shared folders appear in icon view; your kid can launch them with a single click, but she can’t move anything around. The Apple menu offers Sleep and Log Out commands, but there’s no option for restarting or shutting down. The Simple Finder sets up a friendly, uncomplicated interface that young children can navigate easily. If your child craves a sense of independence, you can let her customize her desktop. Using the Fast User Switching menu (which appears in the right corner of the menu bar), log into the new account. Control-click on the Dock and choose Dock Preferences; select Show All to expose all the preferences, then click on Desktop & Screen Saver (there’s no System Preferences entry under the Apple menu in this mode). Show her all the desktop patterns, and have her pick the one she likes best. You can switch to the Screen Saver tab and let her choose one of those, too. Don’t worry if your kid figures out how to open System Preferences on her own: she won’t be able to tinker with anything important—Network, Parental Controls, and Sharing settings, for example—without an administrator’s name and password. Log out of your kid’s account and return to the Parental Controls window in the administrator account. Below the Use Simple Finder check box, you’ll see the Only Allow Selected Applications option. Enabling this feature lets you turn off single applications as well as groups of programs. For example, if you uncheck the Internet box, your child won’t be able to use iChat, Mail, or Safari. Click on the triangle next to Other to reveal all of the programs in the Applications folder. By default, only Apple’s stock programs are enabled. Uncheck any that you want to remove from your kid’s Applications folder. Make your kids feel more at home by letting them choose their own account graphic. Finally, note the four options at the bottom of the window: Can Administer Printers, Can Burn CDs And DVDs, Can Change Password, and Can Modify The Dock (this last one is grayed out if you’ve enabled the Simple Finder). For young children, you should disable all of these options. Configure Content If you don’t want to completely cut off your kids from the Internet, you’ll probably want to control what they can access. Parental Controls’ Content tab can help you determine which sites your children can visit. At the top of the Content pane, the Hide Profanity In Dictionary check box does what it says. It won’t eliminate scientific terms for the body’s intimate parts, nor will it hide literate euphemisms for sexual congress, but it does omit coarse four-letter words. The Website Restrictions area allows three levels of control. Allow Unrestricted Access To Websites grants your kid access to everything. Try To Limit Access To Adult Websites Automatically attempts to eliminate sites containing adult content by previewing pages before they’re displayed and looking for keywords that indicate the site may be inappropriate for children. If you decide on this method, you can also choose to always block or always allow specific Web sites by clicking on the Customize button and adding URLs. For complete control over your child’s online activities, use the Allow Access To Only These Websites option, which lets you create a whitelist of Web sites—a collection of URLs you’ve approved for your kid. Apple gives you a head start by populating this list with nine child-appropriate sites, including Discovery Kids, National Geographic Kids, and Smithsonian Institution. You can add other sites by clicking on the plus-sign button, choosing Add Bookmark from the menu that appears, and entering a title and address. If your child clicks on a link from an approved site that leads to a location outside the host domain, a page appears informing her that the destination site can’t be accessed. If you let your kid use Google to search the Web, you’ll also want to restrict the kinds of sites that show up in search results. Log into your child’s account, head to Google’s home page, and select the Preferences link. Sign in to bring up Google’s Preferences page, then enable the Use Strict Filtering option in the SafeSearch Filtering area. This helps prevent sexually explicit Web sites from appearing during searches. 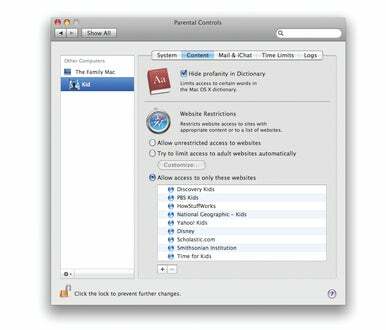 You can use Leopard’s Parental Controls to limit Web browsing to specific sites. Once your children hit the double digits, they’ll feel more than ready to spread their wings and take on the responsibilities of seasoned computer users. You, however, might not be ready to give them this kind of freedom, particularly when they may not fully understand the problems that can result from talking to strangers, sharing files across the Internet, and spending too much time on the computer. Parental Controls can curb some of these activities as well. Control Lines of Communication By the time a child turns ten, he may be ready to have his own e-mail account and spend time chatting with friends. But even if you decide to grant him the privilege, you will probably want to place some limits on his communiques. OS X lets you rein in your kid’s Mail and iChat activities by defining whom he can correspond with. Go to Parental Controls’ Mail & iChat tab, enable the Limit Mail or Limit iChat option (or both), then click on the plus-sign button to start adding approved contacts. (Use the drop-down menu to add AIM or Jabber identities rather than e-mail addresses.) As you enter contacts, you have the option to add them to your Address Book. The contacts end up in your database, not your kid’s (as the administrator, you’re the keeper of contacts for this user). Instead of entering addresses manually, you can click on the downward triangle to select contacts from your Address Book. Parental Controls can also notify you when your child attempts to send e-mails to unapproved recipients. At the bottom of the Mail & iChat window, enable the Send Permission Requests To option and enter your e-mail address. Whenever your youngster attempts to contact someone who isn’t on the list, a notice appears telling him that he doesn’t have permission to send a message to that recipient. If he clicks on the Ask Permission button, Mail forwards you a message asking if it’s OK to send the e-mail, along with an Always Allow button for approving the request (saying yes adds the address to the list of approved contacts). You can receive messages on any Mac, though it must be running Leopard’s version of Mail. Other e-mail clients do not support this remote-approval feature—you’ll get a copy of the message, but you won’t be able to grant permission. Set Limits You know how easy it is to get addicted to your Mac and sit in front of it for hours on end—but you don’t necessarily want your kids to do the same. 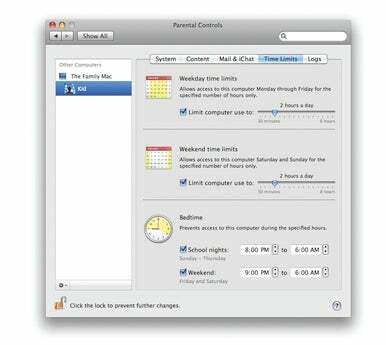 Using Parental Controls’ Time Limits feature, you can manage the number of minutes or hours they spend on the Mac. Under the Time Limits tab, you’ll see three ways to configure your Mac: Weekday Time Limits, Weekend Time Limits, and Bedtime. To set weekday or weekend hours, check the appropriate box and use the slider to set the amount of time your kid can be logged in—anything from 30 minutes to eight hours a day in half-hour increments. When there’s 15 minutes left, a warning will appear on screen indicating that it’s time to wrap things up. There’s an option to add more time (ranging from 15 minutes to the rest of the day), but doing so requires an administrator’s name and password. When time runs out, the account switches to the Mac’s log-in screen and can’t be accessed again until midnight, except by the administrator. The Bedtime option lets you specify when your child can’t use the computer. There are separate settings for school nights (Sunday through Thursday) and weekends (Friday and Saturday). Enable either or both options, and enter the start and stop times for denying access. Keep Tabs You want to trust your children, but it’s nice to know that your trust is merited. Parental Controls’ Logs feature can help. Under the Logs tab, you’ll see a window that includes Websites Visited, Websites Blocked, Applications, and iChat. Highlight Websites Visited, for example, and you’ll see those pages that he’s either accessed directly in Safari, or loaded as part of a visited Web site (an advertisement, say). You can double-click on any site to view the page yourself. You can also check logs from another Mac on the network if you have enabled the option to manage a computer remotely. The Applications entry tells you which programs your kid opened and for how long. If you find a program that you’d like to forbid, select it and click on the Restrict button. The iChat entry lists the people he has chatted with. Click on the triangle next to a name to view a list of chat sessions. Double-click on one of these files, and you can read what both sides said.